El Niño is an oscillation of the ocean-atmosphere system in the tropical Pacific, and has important consequences for weather around the world. El Niño happens every three to seven years. “El Niño” is Spanish for “The Little Boy”. Peruvian fishermen named the event many years ago. They noticed that every few years around Christmas, virtually no fish could be found in the unusually warm waters. 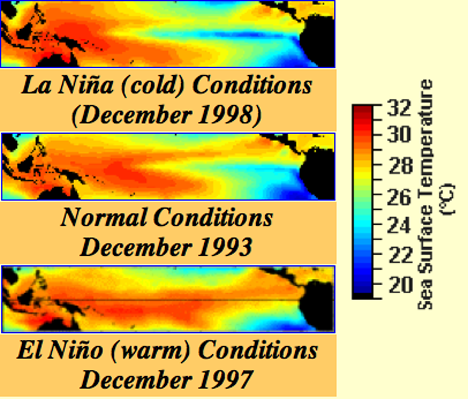 El Niño is marked by unusually warm ocean temperatures in the Equatorial Pacific. The opposite conditions are called La Nina (The Little Girl), characterized by unusually cold ocean temperatures in the Equatorial Pacific. 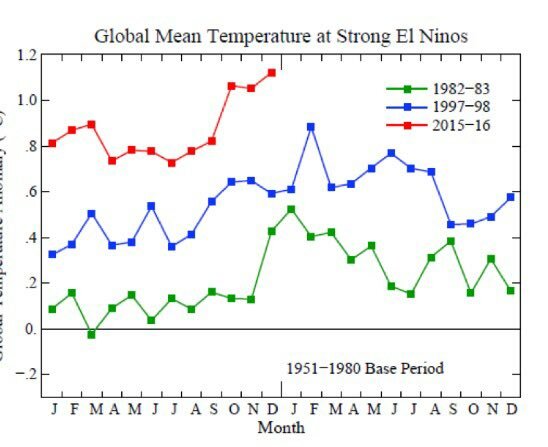 El Nino clearly affects global temperatures. The record-breaking temperatures of 2015 were partly boosted by an El Nino event ... but 2015 would have been the warmest year in the modern record even if there had been no El Nino. Information about El Nino is provided in bulletins produced by the US National Weather Service and the Australian Bureau of Meteorology. What factors can cause climate change?